Synovial chondromatosis (SC) of temporomandibular joint (TMJ) is a rare benign disorder in which mesenchymal remnants of synovial tissue undergo cartilaginous metaplasia. SC affecting the TMJ is a rare condition and difficult to diagnose because of its vague symptoms. The first reported case of SC of the TMJ was reported by Axhausen in 1933. Damage to cartilages in intra-articular structures leads to irreversible joint damage due to pathologic processes involving the synovium. Imaging plays an important role in the early detection of synovial diseases before the occurrence of irreversible joint damage. Accurate diagnosis of SC is based on history, clinical, radiographic, and microscopic examination. Signs and symptoms of SC involving the TMJ do not differ from other degenerative conditions affecting the TMJ. Therefore, careful attention must be paid to the clinical and radiologic features of all lesions affecting this joint. Imaging modalities available for the diagnosis of SC include plain-film radiography, plain-film tomography, computed tomography (CT), magnetic resonance imaging (MRI), and radionuclide scanning. In this report, a rare case of SC from the TMJ perforating the glenoid fossa is presented. To our knowledge, only 26 cases including our case with intracranial extension have been reported in the English literature. An attempt was made to identify clinical characteristics of intracranial extension and focusing on the various imaging modalities which aid in the diagnosis of SC. A 56-year-old male patient came to our department with a history of pain in the right TMJ region for 13 years. He had complaints of pain on mastication and jaw movements. He gave a history of right preauricular swelling and headache involving the right side of the face for 5 years. Pain is of sudden onset and continuous, radiating in nature on the right side of his face, especially worst at night. No history of trauma or any other joint problems was recorded. Extraoral examination revealed a round swelling approximately 2 cm × 2.5 cm in the right preauricular region, which was tender and fixed to underlying structures. TMJ examination revealed the presence of clicking with respect to the right side, mouth opening of 44 mm, and deviation of mandible toward the left side on opening. On intraoral examination, midline shift and the anterior open bite were noted. 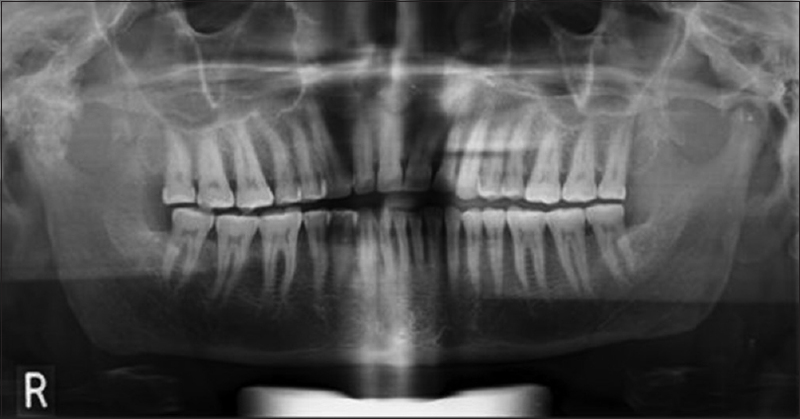 Panoramic radiograph revealed an ill-defined radiopacity adjacent to the right condyle [Figure 1]. As the extent of the lesion could not be evaluated, we decided to image the patient's TMJ using advanced imaging modalities. Cone-beam CT (CBCT) examination revealed flattening in the superior contour of the right mandibular condylar head when viewed on parasagittal and coronal sections along with no gross changes noted in the cortical architecture of the right condylar head. Multiple discrete, spherical-shaped, clumped, and hyperdense structures were noted around the right mandibular condylar head. These appear to be present within the joint space in the medial, lateral, and posterior aspect of the condylar head [Figure 2]. They exhibit irregular surfaces with a hypodense core suggestive of the incremental development of hyperdensity (calcification). Most of these hyperdensities are smaller sized though one hyperdensity presents medially, and anterior to the condylar head is larger in dimension and is attached to the undersurface of the temporal bone. This larger hyperdensity lies close to the foramen ovale, which is positioned medially as a communication to the cranial cavity. The right glenoid fossa showed altered morphology in its anterolateral component with increased hyperdensity and flattening of its anterior articular surface. Thinning and perforation noted at the roof of the glenoid fossa leading to communication with the base of the skull in the region posterior to the right condylar head region and anterior to the right tympanic plate [Figure 3]. 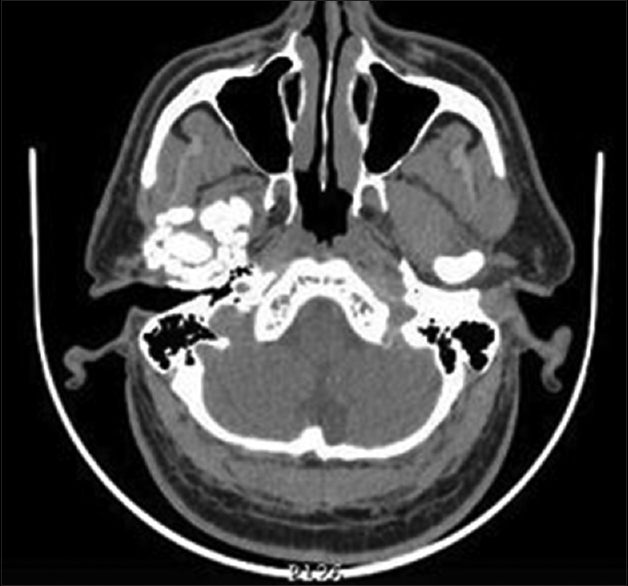 Axial CT image showed widening of the TMJ space and multiple calcifications around it [Figure 4]. 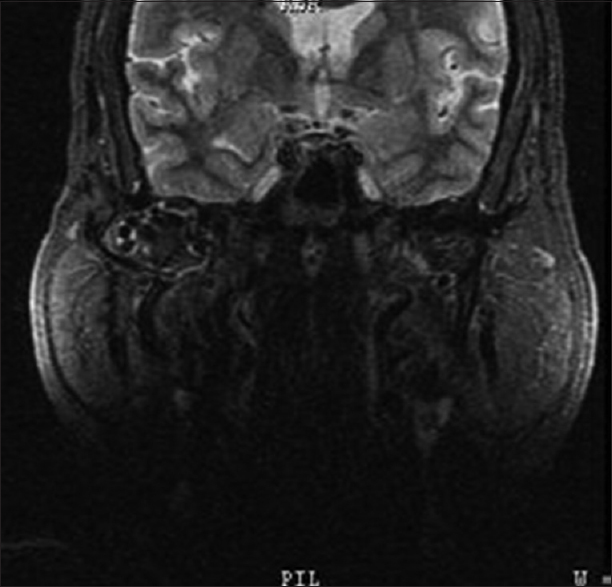 MRI images revealed right TMJ effusion with distension of the periarticular recesses with multiple T2 hypointense loose bodies and indenting the occipitotemporal gyri, due to the erosion of the cranium base [Figure 5]. The history, clinical examination, and especially the radiological findings helped to establish a presumptive radiographic diagnosis of SC of the right TMJ in this patient. The patient was explained about the surgical treatment modality for the lesion. As he was not willing for the surgery, the treatment was deferred. The patient is kept under regular follow-up. SC is a nonneoplastic disease originating from the synovial membrane characterized as a proliferative disorder of the synovium associated with the formation of metaplastic cartilaginous nodules. The nodules then may become pedunculated and get detached as loose bodies. The presentation of SC of the TMJ often mimics other temporomandibular disorders. Swelling, altered occlusion, unilateral pain, clicking, crepitus, deviation, and limited mandibular function are the most common presenting signs and symptoms. Differential diagnosis includes pigmented villonodular synovitis, avascular necrosis of the condyle, degenerative arthritis, intracapsular fracture, and neurogenic arthropathy. SC shows features such as widening of the joint space, presence of multiple calcified loose bodies within the joint space, and sclerosis of glenoid fossa on CBCT. CBCT facilitates thorough examination of TMJ anatomy permitting analysis of bone morphology and joint space in all three dimensions without superimposition and distortions. CBCT offers several advantages over other imaging modalities, including reduced radiation exposure, clearer imaging of the jaw, and simplicity of instrument use. 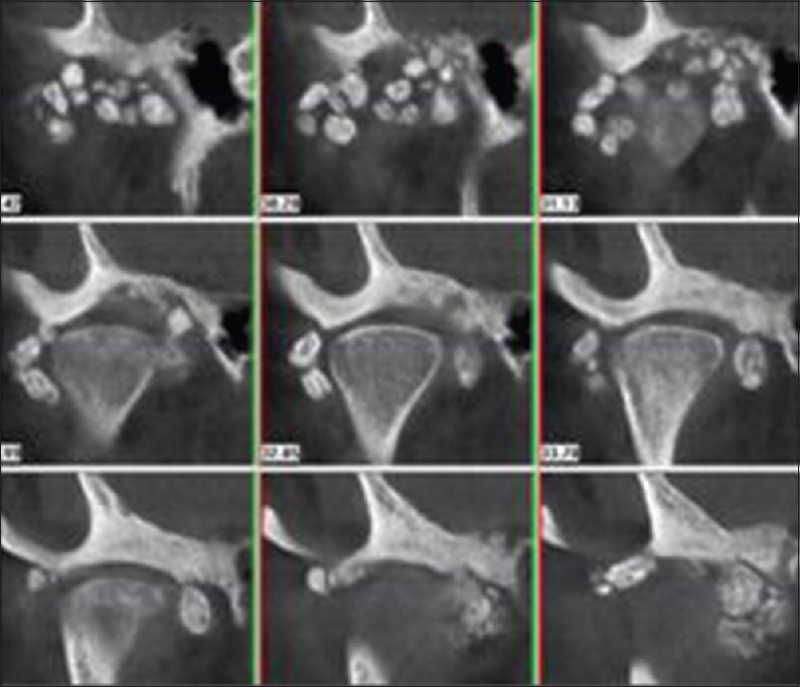 In our case, CBCT was successful in depicting calcified loose bodies, bony changes of the articular surfaces of the condyle, glenoid fossa perforation, and widening of the joint spaces of the condyle. CT is the optimal imaging modality to identify and characterize the calcified intra-articular fragments. SC presents as a soft-tissue mass with low attenuation and a lobular outline. Calcified nodules may present a “ring-and-arc” pattern of mineralization or a target appearance on plain radiographs; these changes are well appreciated on CT. CT is also helpful in the evaluation of extrinsic erosion of bone due to its cross-sectional imaging capabilities. CT delineates a well-circumscribed water-density mass with multiple finely stippled calcification enclosed by the temporomandibular capsule. MRI is the best modality to evaluate the lesion extension as it can depict the degree of extrinsic bone erosion and marrow invasion. MRI shows a distinctive appearance of joint effusion and intra-articular soft-tissue mass with internal nodules. This mass is characterized as hypo/isointense to muscle on the T1-weighted image and hyperintense on the T2-weighted image. MRI examination is the best to evaluate lesion extension along bursae away from the intra-articular component. This feature, if not recognized and treated properly, may lead to local recurrence. The treatment options for SC are surgery and arthroscopy. Arthroscopy is a less invasive technique; however, it is difficult to retrieve the intra-articular loose bodies using arthroscopy. Recurrence is likely on the incomplete removal of cartilaginous foci or hyperplastic synovium, but unlikely even after sparing extracapsular particles, provided total synectomy and discectomy are performed., Hence, once diagnosed, the removal of loose bodies and the synovium with or without condylectomy is the recommended and accepted treatment to prevent recurrence. However, thoroughly complete removal of the loose bodies provided by the surgeon's experience is decisive for the final result. SC arising from the TMJ with extension into the intracranial space is extremely rare, with only 26 reported cases in the English literature till date as per our knowledge. Most of the literature available on this topic originates in Asian countries suggesting an ethnic predisposition or underreporting and/or underdiagnosis in the Western countries. The primary diagnosis of SC is not easy because of the low incidence in TMJ and nonspecific symptoms and signs. It must be suspected if the patient reports preauricular swelling, headache, reduced mouth opening, crepitus or posterior open bite, or the symptom is not relieved and progressive despite appropriate conservative treatment. It may not be detected by conventional X-rays in the case of lack of calcification or ossification. In this case, the major point to be consider with regard to intracranial invasion is the time course. The patient had temporomandibular disorder symptoms for 13 years. Approximately 8 years after the onset of these symptoms, he complained of preauricular swelling and headache. We hypothesize that SC must be present in TMJ region for a long time. Examination of the condition by CT or MRI would have detected the lesion at that time and could have prevented the lesion from invading the cranial base if appropriate treatment was done. In summary, SC is a benign disease with a wide differential diagnosis, which does not respond to nonsurgical treatment and does not show spontaneous resolution. Early diagnosis is very important for selecting appropriate treatment and for a better prognosis. Meng J, Guo C, Yi B, Zhao Y, Luo H, Ma X, et al. Clinical and radiologic findings of synovial chondromatosis affecting the temporomandibular joint. Oral Surg Oral Med Oral Pathol Oral Radiol Endod 2010;109:441-8. Guarda-Nardini L, Piccotti F, Ferronato G, Manfredini D. Synovial chondromatosis of the temporomandibular joint: A case description with systematic literature review. Int J Oral Maxillofac Surg 2010;39:745-55. Holmlund AB, Eriksson L, Reinholt FP. Synovial chondromatosis of the temporomandibular joint: Clinical, surgical and histological aspects. Int J Oral Maxillofac Surg 2003;32:143-7. Milgram JW. The classification of loose bodies in human joints. Clin Orthop Relat Res 1977;124:282-91. Liu X, Huang Z, Zhu W, Liang P, Tao Q. Clinical and imaging findings of temporomandibular joint synovial chondromatosis: An analysis of 10 cases and literature review. J Oral Maxillofac Surg 2016;74:2159-68. Yu Q, Yang J, Wang P, Shi H, Luo J. CT features of synovial chondromatosis in the temporomandibular joint. Oral Surg Oral Med Oral Pathol Oral Radiol Endod 2004;97:524-8. Wong WC, Cheng PW, Chan FL. MRI appearance of synovial chondromatosis in the temporomandibular joint. Clin Radiol 2001;56:773-4. Lim SW, Jeon SJ, Choi SS, Choi KH. Synovial chondromatosis in the temporomandibular joint: A case with typical imaging features and pathological findings. Br J Radiol 2011;84:e213-6. Leite PC, Tolentino ES, Yamashita AL, Iwaki LC, Iwaki Filho L. Surgical treatment of synovial chondromatosis in the inferior compartment of the temporomandibular joint with articular disc involvement. J Craniofac Surg 2018;29:e199-203. Demeulemeester LJ, Bossuyt M, Casselman J, Deschepper C, Ectors N, Van Damme B, et al. Synovial chondromatosis of the temporomandibular joint. Int J Oral Maxillofac Surg 1988;17:181-2. Holtmann H, Böttinger T, Kübler NR, Singh DD, Sproll CK, Sander K, et al. Intra- and extracapsular synovial chondromatosis of the temporomandibular joint: Rare case and review of the literature. SAGE Open Med Case Rep 2018;6:1-5. Ivask O, Leibur E, Voog-Oras Ü. Synovial chondromatosis in the temporomandibular joint: Case report with review of the literature. Stomatologija 2015;17:97-101.